AFRICANGLOBE – Once again, the nation is compelled to mourn the death of police officers. Rightly so, if such mourning changes the dynamics of the relationship between para-militarized police and the communities in which they patrol. By no sense of the imagination should anyone be cavalier about the killing of a police officer, no more than they should be when a police officer wrongly kills a civilian, especially an unarmed civilian. But that is the point. 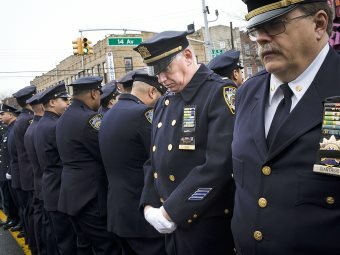 When the valorization of the life of a police officer is raised to the level of hero-worshipping, what does that do to the psyche of the general population in respect to their own lives? 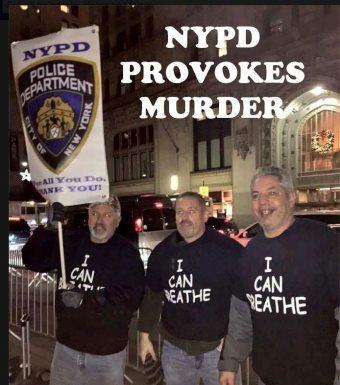 Thus, the Patrolmen’s Benevolent Association’s demagoguery – presumably to enhance future contract negotiations – and self-righteous condemnation must be viewed in light of how it ultimately serves to improve police-community relationships. In my previous blog, “Hands Up, Don’t Shoot,” I ended by stating, “It is time to ensure Black lives matter as much as white lives and that all people’s lives are as sacred as police lives.” So that leads to the question, how is that possible when police lives are considered far more valuable than anyone else’s; they are more valued than the lives of a sanitation worker, a postal worker, a bus or taxi driver, all of whom serve the community. Granted, police officers, like firemen, at times put their lives on the line to safeguard the lives of others. It is terrible that in our highly developed technological society, our humanity has yet to reach a point in which the police have not become obsolete. However, I am of the opinion that the humanity of all of us is challenged by the historical dynamic of racism and capitalism, with its exploitation and profiteering. As was learned from Occupy Wall Street, 1 percent of the population controls and owns most of the wealth in this country. Unfortunately, more often than not, the police are used as tools of the capitalist class to protect financial interests over human interests. This is especially disconcerting as it pertains to the racialized disenfranchised and poor, such as those targeted by racial profiling. In this regard, police violence represents the interests of the state. I was once told that the police are the first line of defense for the maintenance of state power. If this is true, then it is extremely important the community at large recognize how their lives are only as important as the state permits, for as long as they are exploitable and profitable. When will America start to apply its laws consistently? Obviously, the dichotomy between the institution of police and society needs to be investigated and reevaluated, especially when one is armed and militarized and the other, for the most part, unarmed and vulnerable. The public perception and discourse imposed by corporate media shapes our collective thinking on the legitimacy of violence: State violence is legitimate, and any violence not sanctioned by the state is illegitimate. We then consciously accept the inevitability of the state – and thus the virtue of its violence. Hence, because community violence in inner cities is not sanctioned by the state, it must be policed. Generally, we agree with this policing when it saves lives and establishes social order. However, there is a causation for inner-city violence that is not readily considered for problem solving, managed only by policing. Forty years ago, the Black Panther Party sought to challenge the causation of inner-city violence. The BPP attempted to rid the community of drug dealing, gang violence and police brutality and murder, creating free breakfast programs, free community health clinics, supporting tenants’ rights etc. In response, the BPP was confronted with the full force of state violence, essentially destroying a movement with the potential of de-criminalizing the community, forging a revolutionary future. Lest we forget, permit me to remind us all, the death of a movement for liberation serves to keep in place the status quo of state violence in all of its forms. Again, we must loathe all those who fail to recognize the sanctity of life. Therefore, it is extremely necessary to reject corporate media efforts to confuse us with the valorization of police above and beyond the deaths of unarmed civilians killed by police. The noble protests against police violence must not be undermined or in any way disputed; the communities’ grievances are real and must be resolved with justice. We cannot afford to continue to preserve the dichotomy that lends to an inferior-to-superior social paradigm in class and race relationships, and we certainly should not seek to maintain socio-economic disparity that lends to inequitable distribution of wealth. The first line of defense is power to the people! Fist up, fight back! Remember: We are our own liberators!